Round sponge cake: 5 pcs. eggs, 100 g. sugar, 1 pm. l. vegetable oil, 2 p. l. hot water, 80 g. flour, 8 g. baking powder. For the syrup: 150 ml. water, 1 p. l. sugar, vanilla essence. For the rectangular plate: 5 pcs. eggs, 5 p. l. sugar, 5 p. l. flour 1. l. hot water 1/3 h. l. baking powder. For strawberry jelly: 400 g. Strawberries, 3 p. L. Icing sugar 1. L. Starch, 5 p. L. Of water, 10 g. Gelatin, 1 p. L. Milk. For creamy cream: 350 ml. Pastry cream, 5 p. l. sugar, 80 ml. milk, 10 g. gelatine. For garnish inside the cake on it: 350 g.
Recipe for Cake with strawberries and cream is more complex and long to implement, but worth it. Its taste is just fantastic! The first step is the preparation of strawberry jelly. Strain the strawberries with sugar and put in a suitable container on a hot plate at low temperature. Gelatin was dissolved in 2 p. L. Milk, and allowed to swell and the starch is dissolved in water and gradually added to the strawberry mixture with continuous stirring. Once the texture begins to thicken, the mixture is removed from heat and thereto is added gelatine, stirring well to no undissolved granules. Jelly was allowed to cool to room temperature. Boil the syrup for 7-8 minutes. Optionally can be flavored with vanilla or fruit flavoring. The next moment is the preparation of classic sponge cake round. For this purpose, separate yolks from whites, proteins are broken down, while tight, then slow them added sugar, vegetable oil, water and egg yolks – one by one, each broken well before adding the next. This work blender and suspended in stages beginning to add mixed flour and baking powder and stirring is allowed only with classical mixer or wooden spoon. Cake layer is baked in a pan with a diameter of about 26 cm. Of preheated oven of 170`S for 20-25 minutes. The fourth step of the preparation of this incredible dessert is preparing the mixture of the rectangular plate. Beat eggs and sugar for about ten minutes until they are sparkling and air, then gradually add the oil, water and flour mixed with baking powder. The mixture was poured into a rectangular mold (40 x 32 cm. ), Covered with a baking paper and bake for 15 minutes at 180`S. Allow to cool. After a few minutes copious cake layer is covered with strawberry jelly (about 1/2 of the total gel) aligned uniformly and placed in the refrigerator where it should remain at least two hours. At that time can be prepared and creamy cream, and cream crashed with 5 p. L.
Sugar, while rise up and become fluffy, then slowly add milk-gelatin mixture (10 g. Gelatin dissolved in 80 ml. milk) and crashed a few minutes. It is time to proceed to the assembly of cake. The rectangular plate is removed from the refrigerator and cut into strips with a width of about 3 cm. The round sponge cake is cut into two halves and the first circle is placed on a suitable surface where syrup and covered with a creamy cream. Then take the tape with strawberry jelly, rolls up into a roll and placed in the center of the base plate. Take a second strip and is wound around the first, third is wrapped around the second and so on until crawls the entire crust. Usually remains unfilled space in the original recipe is filled with pieces of biscuit dipped in milk. The most suitable biscuits or tea biscuits. Everything is covered with cream from the cream. On it are arranged to cut thin strawberries sprinkled with some sugar, then placed the other half of the circular sponge. It poured the rest strawberry jelly and carefully smoothed. 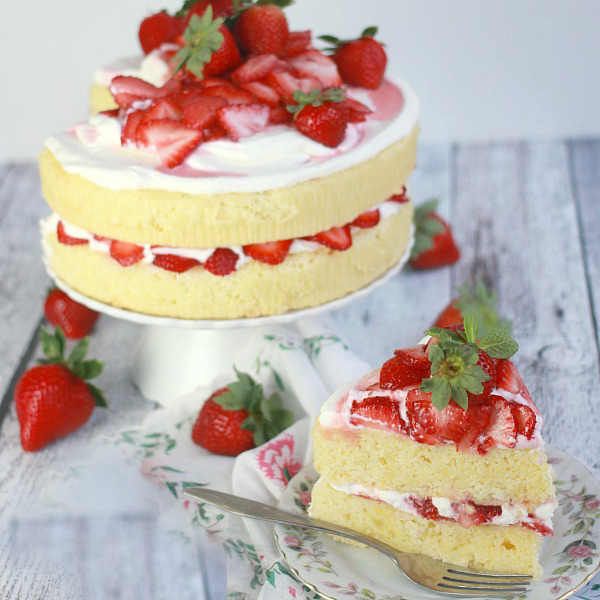 The edges and sides of the cake can be embellished with a small amount of cream and top layer as desired can be arranged with sliced strawberries into halves or pieces with a preferred size. The cake is harvested in the refrigerator overnight. After all this remains just enjoy it! This wonderful sweet temptation would be a memorable highlight of any special occasions – from birthday and name day to this, to prepare a surprise for a loved one.